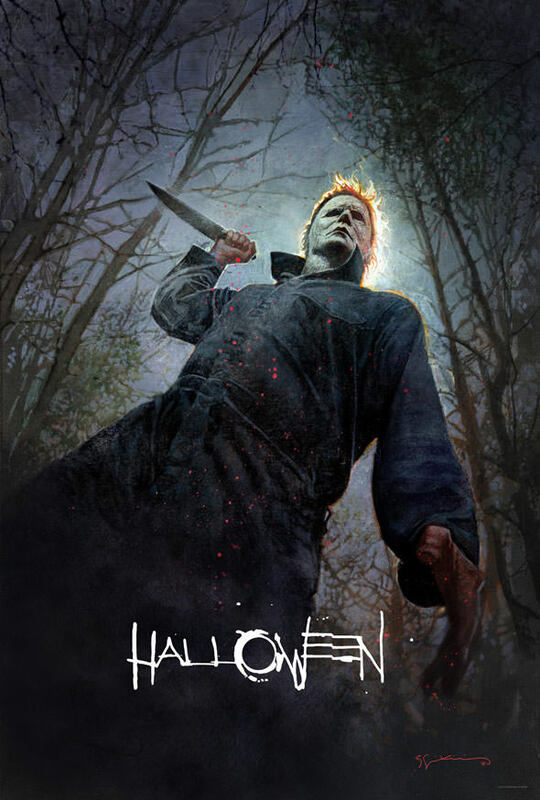 Universal Pictures and Blumhouse Productions have unveiled a San Diego Comic Con exclusive poster for the new “Halloween”. The one-sheet was created by acclaimed artist Bill Sienkiewicz and comes ahead of a panel for the film later this week and probably ahead of the film’s second trailer. “I go to the actors and get their feedback and we do read-throughs and rewrites and improvisations. I’m all about reworking. A script to me is always just a blueprint and then [we] feel our way through it, together. There’s some scenes that we’ll say, let’s not even use the script, we know point A and B, let’s put it in our own words. I’d play music on set sometimes and just trying to keep it fresh, so it’s not so overly rehearsed. Jamie Lee Curtis reprises her iconic role of Laurie Strode, who comes to her final confrontation with Michael Myers – the masked figure who has haunted her since she narrowly escaped his killing spree on Halloween night four decades ago. Judy Greer and Andi Matichak co-star in the film which is slated for release October 19th.